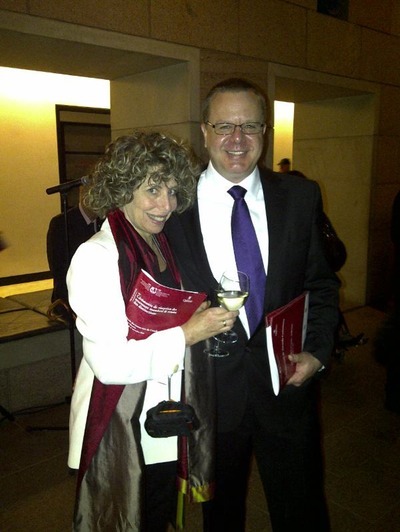 My wife, Jody Joseph, and me at the Royal Society of Canada awards ceremony in Nov 2010. The research focus of my group in recent years has been on what can be learned from studying the "light echoes" from luminous transient events like supernovae. Once considered a curiosity or merely a tool for mapping the distribution of interstellar dust near such events, we have now been able to extend the use of "light echoes" to studying the asymmetry of the events themselves - a key observational constraint for computational models of supernovae explosions. Furthermore, centuries-old supernovae which occurred before the advent of modern scientific instrumentation can now be observed "again" due to the time delay introduced by the non-direct path taken by the scattered supernova light. My interest in supernova light echoes began when I was a member of the SuperMACHO Project and when we discovered a source of "noise" in images associated with microlensing alerts. The "noise" ended up being light echo systems associated with three ancient supernovae in the Large Magellanic Cloud (LMC). A long and productive collaboration with Armin Rest (STScI) and his group has resulted in numerous light echo findings associated with supernovae in the LMC and historical supernovae in the Milky Way galaxy. Recently, we have also successfully applied our light echo analysis techniques to historical eruptions of the supernova precusor eta Carinae. I have an on-going interest in pulsating variable stars, including both intermediate-mass Cepheids, their lower-mass counterparts known as Type 2 Cepheids, and RR Lyrae variables. I also work on the hydrogen-deficient R CrB stars with my collaborators Geoff Clayton and Patrick Tisserand.